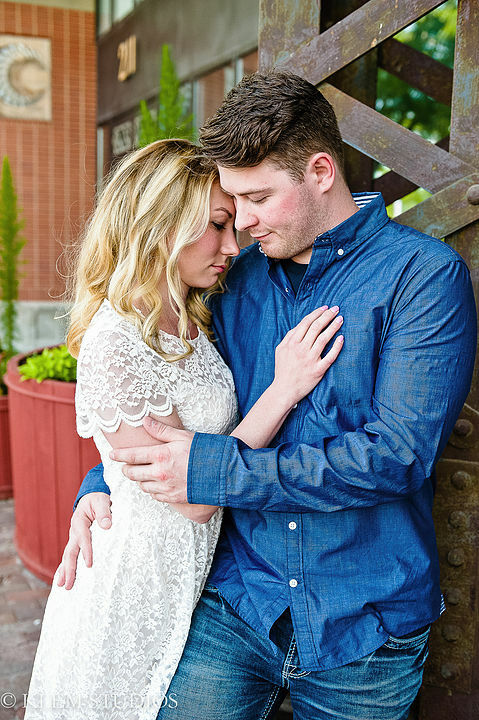 We had a chance to take some time out of our busy schedules and appreciate life for a little while during Megan and Lane's engagement session. We met at Kavarna in downtown Green Bay and sipped on some iced tea, catching up as the session began. Of course Megan was stunning in her lace dress from Express, but I've got to rave about the groom-to-be. He picked out his own outfits, and man, was he stylish. Cuffed jeans, button-down shirt, and classic brown shoes, I think he could teach my fiancé a thing or two! Megan and Lane chatted about the next steps they want to take after purchasing their first home (Lane is jonesing for a boat, while Megan would like to do some landscaping). As we strolled down Broadway in front of Old Fort Square, Lane gently teased Megan about her inability to tell a joke. Want to know her favorite? "What's brown and sticky? A stick!" Megan and Lane both enjoy being on the water, but since Lane doesn't have that boat yet, we opted for a stop on the bay near UWGB. These two were such troopers and happily walked barefoot amongst the zebra mussels and rocks along the shoreline. They danced under the shade of a cottonwood tree, laughing and spinning 'round. Lane is extremely proud of his big, black truck, so we backed that Dodge up and dropped the tailgate. Lane and Megan happily snuggled up next to each other as I climbed on top of my car to get the shot (don't tell my insurance agent!). These two flow so easily back and forth, their relationship is admirable. Personally, my high school and college relationships were tumultuous, giddy, and sometimes laughable. I can't even fathom the amount of strength, patience, and understanding that has gone into Megan and Lane's journey. 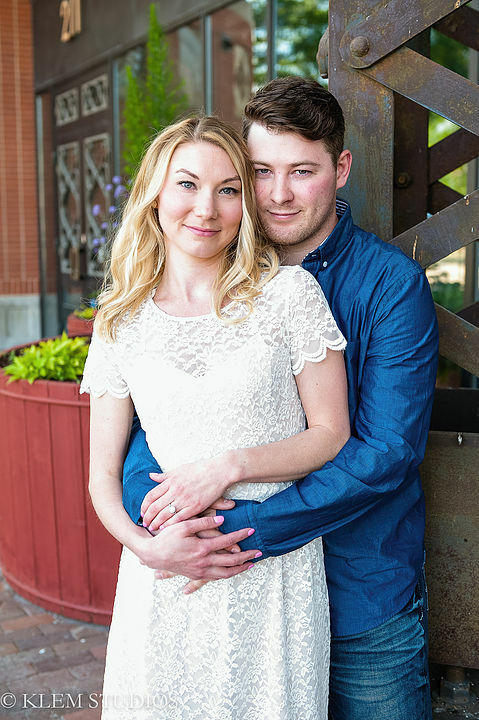 Their love story is incredibly beautiful, and it shines through beautifully in their images. Their New Year's Eve wedding is going to be the celebration that brings down the house, and I know we're all eager to party with the new Mr. and Mrs. It's been a long time coming, but the journey is often the greatest part. Enjoy the ride, Megan and Lane. Thanks for letting me ride shotgun on this part of your story.